This is an old article, and some of the information in it is obsolete. 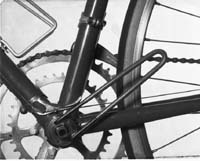 In my two earlier articles on cranksets (Bicycling, January/February and March 1983) I discussed how to remove and replace the cranks on both cotterless and cottered cranksets. Now that you're well-versed in crank removal, it's time to take the surgery one step deeper and remove and replace your bottom- bracket bearing cups. You need to do this to overhaul the crank-spindle bearings, replace the spindle, or replace the crankset. To service the bottom bracket bearings of a normal, three-piece crankset, you must remove the bearing cup on the left side. This cup is known as the adjustable cup, and will be equipped with a lockring. The lockring must be loosened or removed first. This requires a special wrench, called a C spanner, commonly referred to [in the U.S.] as a "spanner wrench." This tool usually has a semicircular end with an inward projection at the end of the C away from the handle. The semicircle wraps around the lockring, and the projection fits into one of the notches that are cut into the edge of the lockring. This type of tool will fit almost all brands of bottom-bracket lockrings. There are two concerns for a good fit with a C spanner: the radius of the curve of the tool must be reasonably close to that of the lockring, and the projecting tab that does the grabbing must be small enough to fit the notches in the lockring. All bottom bracket lockrings are similar enough in size to cause no problem with this type of tool, but some have fairly small notches. If your C spanner has a tab that is too large to fit into your lockring, it is a small matter to grind a little bit off the end of the tab. Just be careful not to overheat the tool when grinding it, or you will weaken it! Raleigh makes [used to make] a few multi-purpose flat wrenches, one of which includes a small C spanner, and Sears Roebuck makes a very compact C spanner which is well suited for on-the-road repairs. If you buy either of these small spanners, you will probably have to grind the tab down to fit (the Raleigh spanner fits Raleigh lockrings as supplied, but most other Iockrings have smaller notches). These small wrenches do not have long enough handles to give proper leverage by themselves, so they must often be struck with a hammer (or a rock, if you are on the road!) to apply the required torque. This constitutes abuse of the tool, but it is better than hitchhiking! These small tools are mainly suitable for on-the-road repairs. 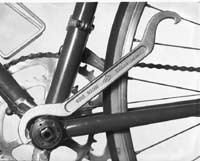 For shop use, large, shop-type C spanners manufactured for bicycle use are more practical, but these are too large to be conveniently carried on a bicycle, so they are not suitable for touring. Artisan and Campagnolo offer shop versions of the nicer-fitting T.A. spanner, too. It is also possible to buy special pliers for lockrings; these are expensive (more than $20), but the most convenient and fastest tool for the job. Once you have loosened or removed the lockring, the adjustable cup will be free to turn. Some adjustable cups have a hexagonal projection or wrench flats. These can be turned with a conventional wrench after the crank has been removed from the spindle. Most adjustable cups have small holes drilled into them to accept another, special type of wrench, a "pin spanner." Some pin spanners have the pins fixed at a set distance apart; these will usually fit only one or two brands of cups. The more versatile type of pin spanner is similar to a pair of pliers with pins sticking out of the sides of the jaws. Both types of tools usually have replaceable pins, so that if the pins wear out or break, you can unscrew the old ones and put in new ones. This is a good idea in principle, but my favorite pin spanner, the Park SPA-1, does not have this feature. The reason that I am willing to forego interchangeable pins is that having fixed pins enables the Park tool to have smaller ends. This makes it possible to make minor bearing adjustments without removing the cranks! The ends of this tool are shallow enough to fit between the crank and the bearing cup in most cases. Some cranks sit close enough in that the tool will not fit without a slight bit of grinding of the backs of the pins. For normal servicing, only the adjustable (left) cup need be removed. It is a bad idea to remove the fixed (right) cup for a routine cleaning and repacking. The fixed cup should only be removed when it is going to be replaced with another one, as when replacing an entire crankset. Before you try to remove a fixed cup, you must determine whether it has a right-hand (standard) thread or a left-hand (reverse) thread. There are five normal bottom bracket threadings: British, French, Italian, Swiss and Raleigh. 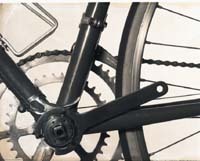 Bicycles built to French or Italian standards have a normal right-hand threading for the fixed cup. The normal action of pedaling will tend to loosen a right-hand threaded fixed cup, so they have to be screwed in very, very tightly to keep them from unscrewing themselves. The fact that they are screwed in so tightly also means that it will require a lot of force to unscrew them. Bicycles built with British, Swiss or Raleigh threading use a left-hand thread for the fixed cup. Since the pedaling action will tend to tighten a left threaded fixed cup, these are also likely to require a lot of force to remove. Most American and Japanese frames of good quality use the British threading. Fixed cups have wrench flats, so you might think a very large wrench would be sufficient to remove the cup. Not so. The cups are screwed in too tightly, particularly since the wrench flats are only about three millimeters wide-too narrow for a wrench to get a good purchase on the cup. Very elaborate, expensive, and special tools are sold to bicycle shops for fixed-cup removal and installation, but they are not really necessary. A few cheap home remedies can do the job quite well. The first home remedy demands that you have a high-quality bench vise. Simply grab the fixed-cup wrench flats in the vise jaws, making sure that you have good contact with all of the wrench flats' meager width. Grasp the bike frame and unscrew it from the cup. This technique works quite well. If you don't have a bench vise, or if the vise technique happens to not work well on your bike, you can make a universal fixed cup tool for less than a dollar (assuming you have access to a couple of large wrenches). The tool is an imitation of a $40 shop tool that fits into the fixed cup as a crank spindle would, and pinches the cup. You apply unscrewing force to the tool, and it transfers this force to the cup with this tight friction fit. The tool consists of a large bolt, a nut or two, and a few washers. 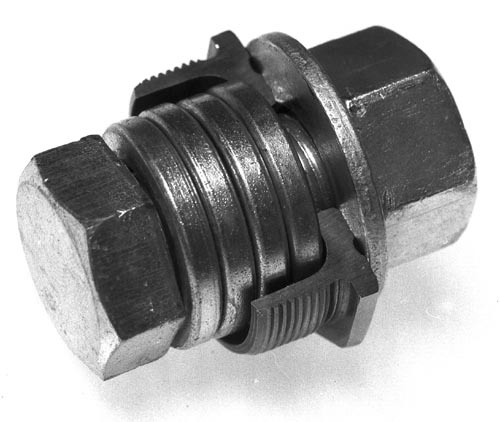 The size of the bolt is not particularly critical, as long as the bolt is strong enough not to break, but small enough to fit through the hole in the cup. I used to use an ordinary 1/2-inch, 13 TPI hex bolt (also called a "cap screw"), which served me well for quite a while. It finally met its match on friend's Schwinn that had an unusually tight fixed cup; the bolt snapped in two before I could remove the cup. Now I use a 5/8-inch 18 TPI hex bolt 1 1/2inches long, with a nut, a flat washer, and four lockwashers. The 5/8-inch size is the largest standard size that will fit through the hole in the cup. This bolt and nut both take a 15/16-inch wrench. With my 1/2 inch drive Craftsman six-point socket set, the 15/16-inch socket is also the largest size that will fit into a normal bottom bracket shell. If you have some other brand of socket, check the fit before you buy the bolt and nut-you might need the next size down (9/16-inch). Home-made tool shown in cutaway bottom bracket cup. The bolt is put through the cup from the inside of the bottom bracket, and the nut screws onto it from the outside. There should be washers on both sides of the cup. You will need a socket wrench and a short extension to tighten the bolt from inside the bottom bracket, and a box wrench for the nut. A large socket wrench will not fit into the cup, so you will need some small-diameter washers to space the head of the bolt out so that the socket wrench can reach it. This is what I use the four split lockwashers for. I didn't need lockwashers as such, but the readily available flat washers were too large in outside diameter to fit into the cup. To remove a right-threaded fixed cup (French or Italian), tighten the bolt with the socket wrench from the inside of the bottom bracket, holding the nut with the box wrench. Once the bolt is as tight as can be, keep on tightening it, until the cup screws itself out. Once the cup starts to move, turn both wrenches together. To remove a left=threaded (British, Swiss or Raleigh) fixed cup, hold the bolt with the socket wrench and turn the nut with the box wrench. Use the same tool the opposite way to install the new fixed cup. You might worry about damaging the cup, but this is not likely to happen. The washer doesn't usually come into contact with the bearing surface. Even if it did, bearing cups are made of extraordinarily hard, heat-treated steel, much stronger than that used to make washers.